The DS6500 Bates Stamp Printer is a high speed, stand alone, programmable and fully automatic, Bates Numbering System. 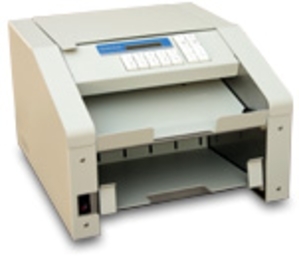 The Sheartech DS6500 Bates Numbering Stamp is a high speed, programmable, inkjet, automatic sequential page numbering machine (paginator) with an integrated auto feeder. The DS6500 Bates Printer dramatically increases productivity by automating such time consuming jobs as Sequential Page Numbering, Document Counting, Bates Numbering, Labeling, Time/Date Stamping and Paginating Regulatory Comission documents where unique page identifying information is required on the top or bottom zone of letter size documents. Eliminate the inconvenient, fatiguing and manual task associated with Bates Numbering using a hand-held Bates stamp, pre-printed labels or expensive outside services. Take a close look at the DS6500 Bates Numbering System and see for yourself how it can automate and dramatically improve your Bates Numering Stamp processes. The DS6500 Bates Numbering Printer has a built-in Clock, Calendar and Counter...Automatically advances the Year, Month, Date, Time and numbers internally. Ink Cartridge capacity provides approx. 5, 000, 000 characters in standard font size. Quick Change Print Formats...easily reprogram what the DS6500 Bates Stamp Printer, with sixty programmable and selectable print format lines. Five types of Variables... Date/Time, Numeric Prompt, Alpha-Numeric, Counter and Group Counter. Complete Shear Tech DS6500 Bates Numbering Stamp Printer Kit includes; (1) DS6500 Bates Numering Printer, (1) Black Ink Jet Cartridge, (1) User Manual. 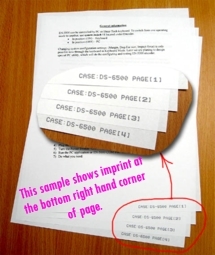 Law Offices...Automatic Bates Numbering for litigation documents. HMO/Insurance Companies...Claims departments typically print Time Date and Sequential Numbers of health claim forms. Medical/Pharmaceutical Companies...needs to print Time, Date and Alpha-Numeric information on internal reports. Regional Water Control Offices...Sequential Numbering of water quality reports. Banks...Page Counting of statements and loan applications and other documents. Many print configurations as a Bates Stamp... a) Custom Text and 6-Numbers or b) Date, Time, Text and 6-Numbers c)Date, Time 6-Numbers, etc., Endless Possibilities!! PROGRAMMABLE...Bates Stamping now and Page Counting or Time Date Stamp imprinting later. 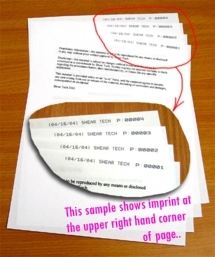 NO LABELS NEEDED...With the Shear Tech DS6500 Bates Number Stamp Printer, say goodbye to the use of printed labels and the very time consuming process of applying those labels to your documents. Sample #1: The above sample indicates the Imprinted Bates Stamp was programmed for the bottom right hand corner of the document. Sample #2: The above sample indicates the Imprinted Bates Stamp was programmed for the upper right hand corner of the document. NOTE: This Printer can be used for high speed Page Counting...without printing any bates numbers or text.